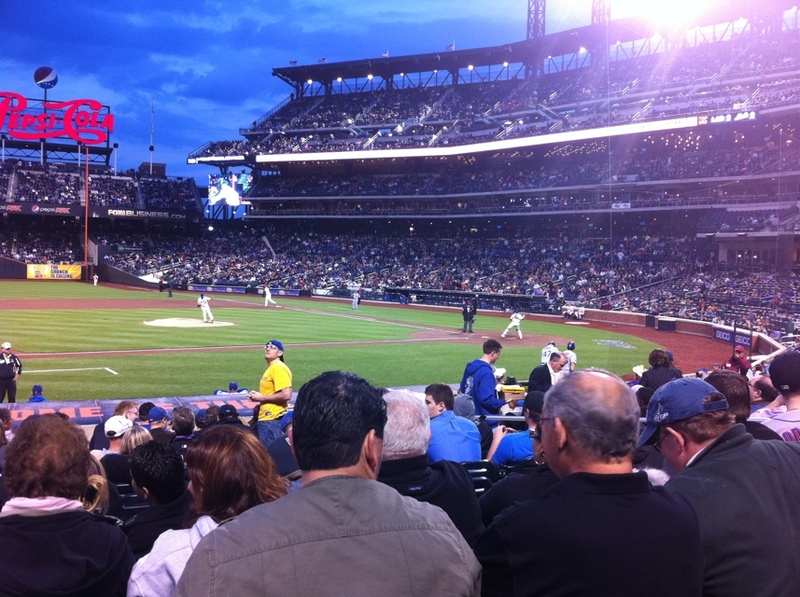 I took in a game the other night at Citi Field – a rare winner for the Mets, as it turned out. Going to a ballgame is absolutely wonderful, and can be dauntingly expensive (particularly when dining with Mark at Yankee Stadium). Citi Field (I still tend to call it by its maiden name, Shea Stadium) however offers a much different experience than Yankee Stadium, particularly from a food perspective. I am glad to say that the food and drink choices at Citi Field are far better than those at Yankee Stadium, and significantly cheaper to boot. The problem, though, is getting them. I realized something very significant during this trip: do not go to Citi Field for a night game and expect to eat as well as possible. There are so many terrific vendors and concessions at Citi Field that it would be sore tempting to try to eat your way through them. At our seats. These seats - 14 rows back from 3rd base - were $80. You see, Citi Field just isn’t quite the operation Yankee Stadium is. It’s the little things, like the seats (no cushions, which is fine, but at Yankee stadium: cushions). Although they advertise “in seat service” for the fancy tickets we were holding, the folks you might order from didn’t make themselves visible until well into the second half of the game (Mark would never allow that up in the Bronx). Now I am certainly not above going to get food at a stadium, far from it, but if they’re going to say you get a service for your $80 tickets, you ought to get the service, right? Either way, no sooner had we landed at our excellent seats than we immediately stood up to go get food. At Citi, as I mentioned, there are numerous worthy options. At the massive, packed food court. This is when I learned a valuable lesson: don’t go to night games and expect to get food. There are a lot of great choices. 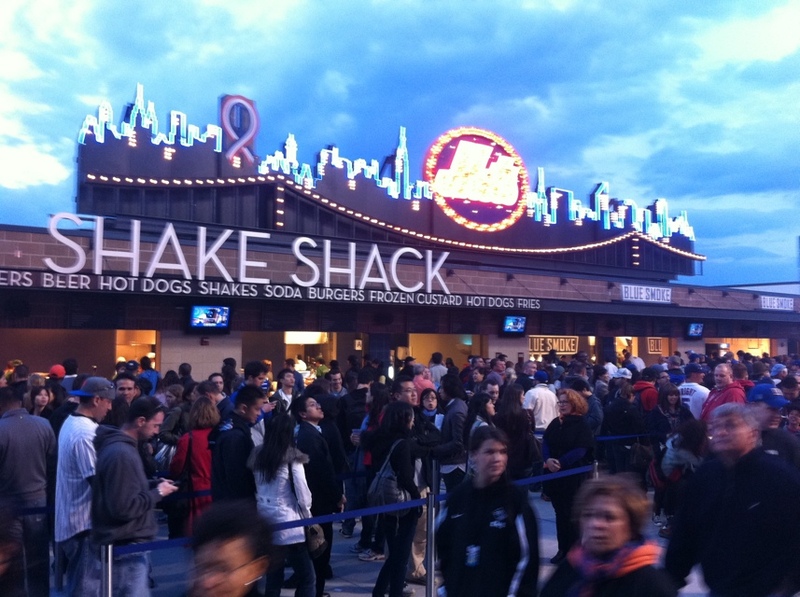 Shake Shack is (inexplicably) the most popular. There’s also Blue Smoke Barbecue, Mama’s of Corona, Nathan’s Hot Dogs, and my go-to spot for reasons I am about to explain, El Verano Taqueria, which is my suggestion for where to eat at Citi Field. Purchase a hot dog while waiting on line? Yup. The reason the food at Citi Field is problematic at night games is obvious: it’s dinner time. So the lines for these excellent resources are absolutely hellishly long. I can’t imagine how long the wait for Shake Shack was (or why somebody would choose to waste two innings or so for one of their burgers). Blue Smoke is pretty good, but… . The Taqueria makes a fantastic product and, best of all, it boasts the shortest lines, every time. Even though it had the shortest line, though, it was still long enough to justify the purchase of a hot dog during the wait. Truthfully, if I were the hot dog guy, I’d just troll those lines. The only downside to the Taqueria is their beer selection is quite poor. I was able to nab a Bass(!) from the international beer stand, but it would be great if they had some quality beer at the Taqueria. They have beer, it’s just not very good. 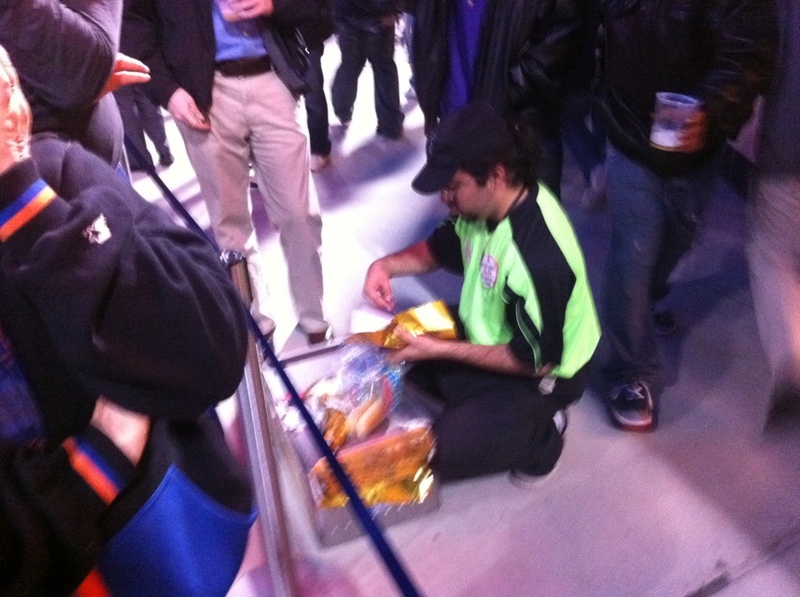 One particularly nice feature of Citi Field is the do-it-yourself condiment stands. Got a dog? 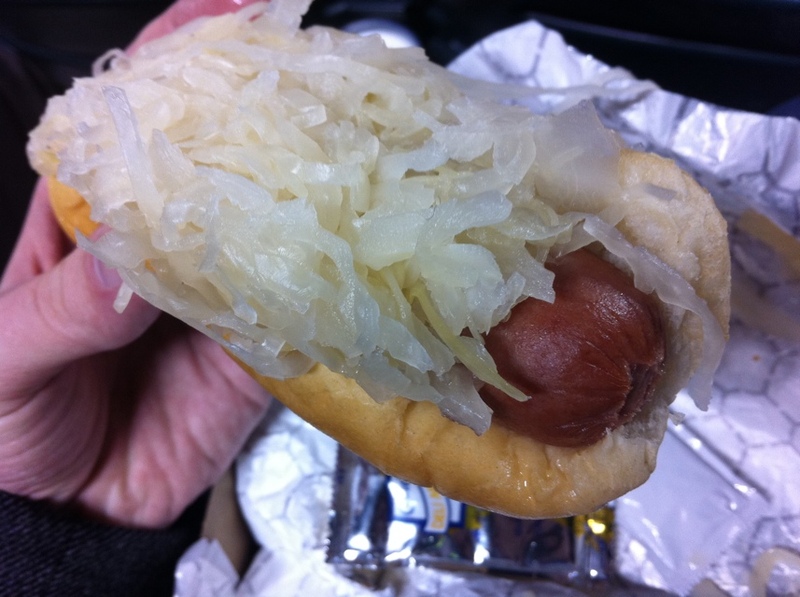 Load it up with kraut, onions, whatever, to your heart’s content (or Angina kicks in). Nothing complements the Nathan’s hot dog quite so well as a sloppy pile of sauerkraut. What a win. But back to the tacos. For about $8 you get two excellent tacos. Granted they are not piled high with cheese and lettuce and whatnot, but they are of the gourmet variety. The beef is skirt steak, and the carnitas I believe are pulled pork shoulder. Either way, they are fresh, high quality, delicious and relatively inexpensive. 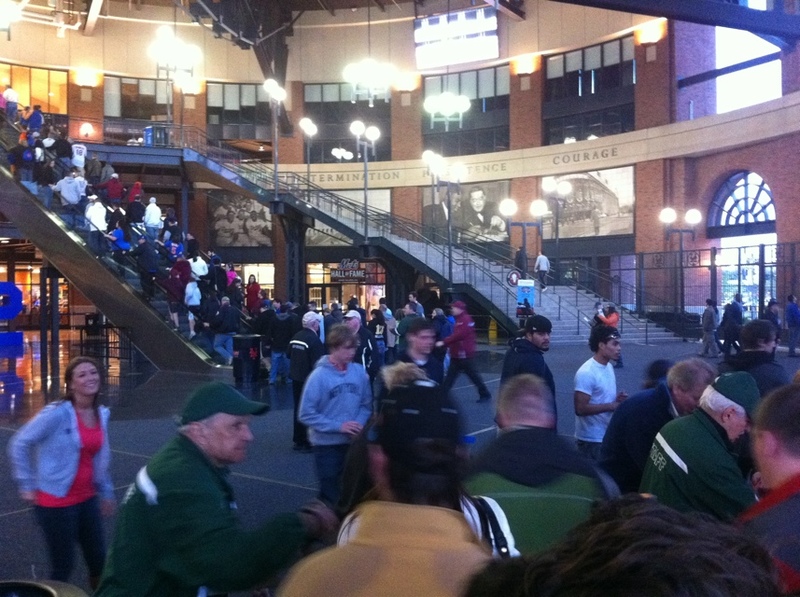 And the line moves quick (comparatively), so you can get back to the game faster. 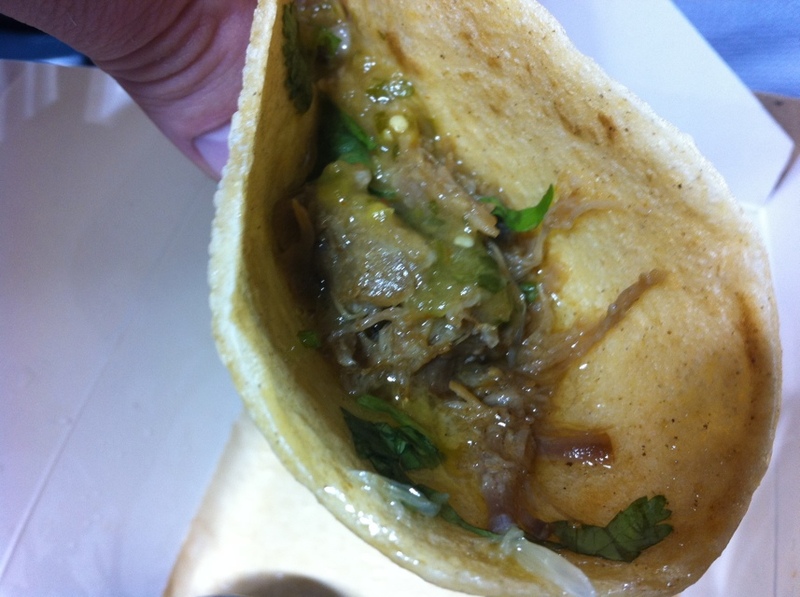 I don’t think they are quite as good as the excellent gourmet tacos at the Calexico cart. But they are just excellent nonetheless. 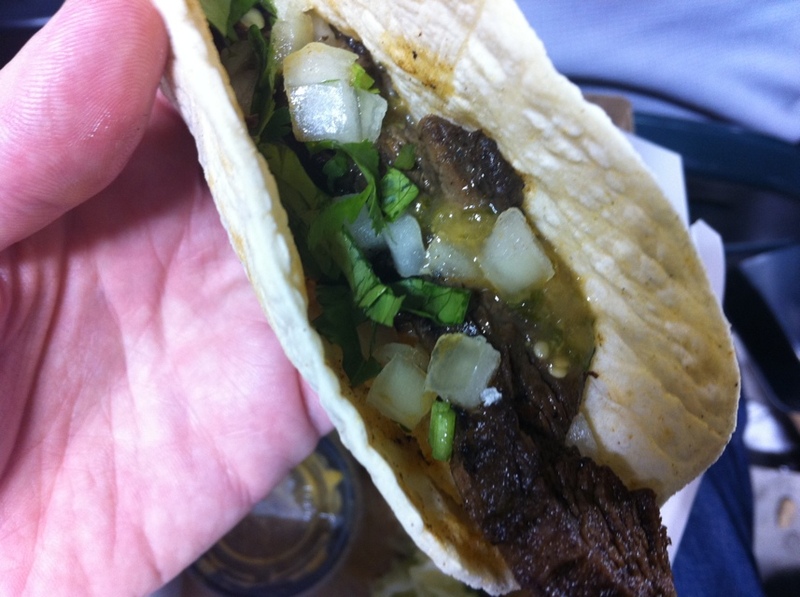 The beef is smoky, hefty, filling and satisfying. The pork is sweeter and delightful. They’re worth the price and a decent portion. Could they be bigger? Sure, but… . On balance, they are my go-to when at Citi Field. 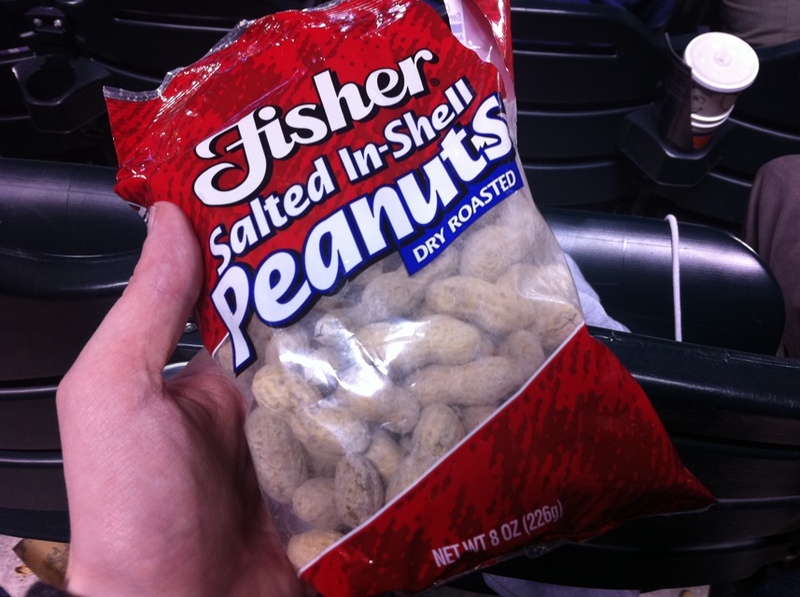 The peanuts... not the same maker as Yankee Stadium, but still delicious. Now there’s lots of other stuff you can get: sausage and peppers, hot dogs, Mama’s of Corona (which I adore, but that’s another story – suffice it to say I strongly, strongly encourage you to visit Leo’s Latticini in Corona if you get the chance to load up on the real stuff), and so forth. While Mama’s at the stadium is very tempting, I found the $10 price point a bit high for the bready sandwich they offer. Go to the shop in Corona and let them take care of you – you will LOVE it. I’ve got to get back there – one Zipcar trip, coming up. What do you mean, you're out? If Mark is shrewdly running Yankee Stadium, his cousin Les (Les M. Pressive) seems to be handling the waiter service at Shea – I mean Citi Field. Finally back at our seats and gobbling everything in sight (the hawkers who shlep peanuts, beer, soda and so-on were all over the place, which was very good), the promised waiter finally arrived at our seats somewhere around the sixth inning. And told us they were out of popcorn. A quick trip to the john yielded a popcorn cart, with fresh hot fare popping happily away. It’s baseball: if you say you’re out, you should be out, no? Anyway, these are nit-picks. The place is an awesome foodie destination. They even have these awesome picnic tables set up overlooking the field in the food courts. That’s fantastic. It is a great place to visit and get generally terrific food. And the baseball, believe it or not, can be pretty good too. Wow, so much here that caused a visceral reaction in me! FYI, no Zipcar is necessary for a trip to Mama’s – it’s rather walkable to the train station, and Tortilleria Nixtamal (excellent tacos – better than Verano by leaps and bounds) as well. I even daresay you can easily walk from there to the stadium (which I’ve done), superceding any need to wait on line at all. Though the official policy is that no outside food should be brought in, I’ve yet to encounter a problem as long as I showed it to them and it was clear that I was bringing in a normal amount of food (ie, not so much I could sell it to people). I don’t generally sit in the expensive seats, but the one time I did, the servers – during a terrible downpour – were very attentive and appeared often to check on people. It seemed to be best to grab one of the order pages (which are meant to be stuffed into the cupholders at the expensive seat) and mark your order, then hold it up a bit so someone could easily spot it… I don’t think they came down much unless people seemed to look like they wanted to order. Can’t really comment on that, though. As for the popcorn- the servers receive their food from one place, so if they are told it’s out, they are not going to (nor are they allowed to, as far as I know) go to the popcorn stand to grab some even though there’s plenty there. Given that it’s lunchtime for day games, I would suggest that your reasoning behind the food lines being long is a bit flawed. They’re just long because from this post, it appears you’re going to the wrong area. Taste of the City is always going to be crowded and annoyingly overlogged with people, because that’s where everyone is told there’s Shake Shack and the overflow just goes to the other stands. There’s another Blue Smoke & Box Frites on Promenade level (which, in all fairness, if you’re sitting on field, is kind of far from you; but I find so are the Taste of the City stands far from most seats), and I’ve been told there’s a 3rd Blue Smoke location I haven’t yet sought out (on field level). I really like my seats in promenade level – 510-511-512-513-514 are all relatively close behind home plate, though high up – you get a great view, and they’re not that pricey. But they also have behind them the second Blue Smoke, Box Frites, and Mama’s locations (plus a big beer stand, Carvel, Subway, pizza, burgers, etc etc etc), and there are rarely very long lines at those named stands (the line at Nathan’s seems to always be too long for what it is). Thanks so much for the thoughtful reply. I would LOVE to bring food in to the stadium (although with so much good chow there, it seems excessive). The Mama’s fare is not up to the standard of the real Leo’s Latticini, imo, so if I could bring in some of the genuine article, so much the better. As far as Taste of the City and the perpetual mob scene there, you’re right, it is always pure chaos. However I’ve been during day and night games and this night game was by far the worst I’ve seen the lines. It’s my first time sitting in fancy seats at Citi – but it was also the first time sitting in fancy seats at Yankee Stadium – and the difference is definitely noticeable. Not just in terms of price point, but in terms of service. I’m not really wild about the Blue Smoke and Box Frites offerings, but admittedly your strategy of getting to them is the way to go. Next time I may indeed try to sneak in a Mama’s hero. Any excuse to get back to it is welcome. It’s very hard to not draw comparisons between the Shea (CitiField) Experience and the Yankee Stadium experience. Price: LET’S GO METS. As distasteful as it is to say, perhaps a ‘thank you’ might be due to the arch-criminal Bernie Madoff for bringing comparatively affordable and accessible baseball back to New York. Service/ease of access to food: YANKEES. Who wants to wait on a painful, unending line for food? I figure that Shake Shack must be a big treat for non-Manhattanites who do not have a local branch. When the waiter eventually showed up to our excellent seats, and told us they were out of popcorn, his defiant comment was ‘this is not the circus!’ It was a funny line, confidently delivered, though his point is debatable. Better Food: YANKEES. I prefer the Carl’s cheesesteak at Yankee Stadium to the tacos at Shea, and the Barzini peanuts in the shell and the Popcorn Indiana popcorn are better at Yankee Stadium than the brands served at Shea. I do, however, very much concur with the observation about ‘krauting your own Nathan’s dog at CitiField – it makes for a much better hot dog. If you look at a line by line comparison between the Yankees/Mets experience above you might think the clear choice for an evening out is Yankee Stadium. 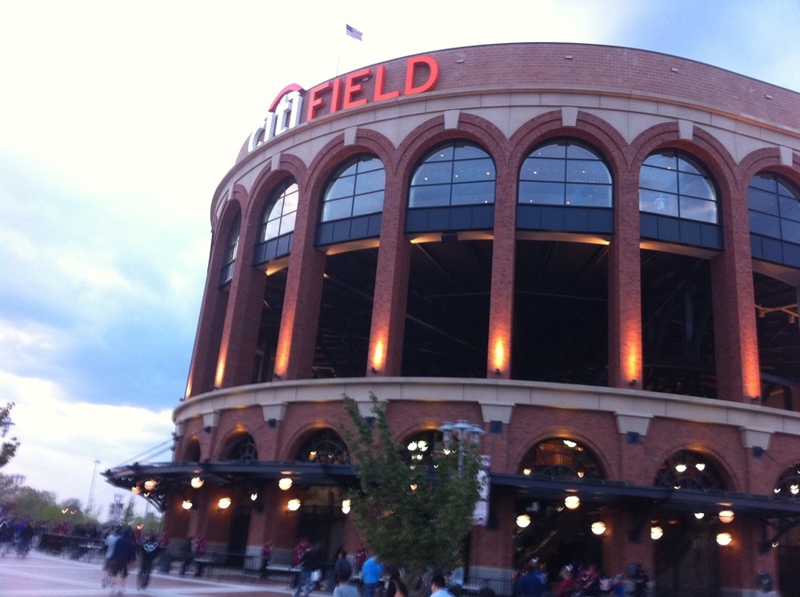 That said, CitiField is much, much cheaper and easier to access. You get a better seat, easier for much less money at CitiField. One spontaneous game-day seat at Yankee Stadium from the Yankee ticket booth: $150 for the cheapest available seat. A spontaneous, game day seat from the CitiField ticket booth: “how much do you want to spend?” (and about $90 bought a field level seat fourteen rows above Third Base at a Dodger game). Sorry Hugh, but the better food, by far, is at Shea. No question. 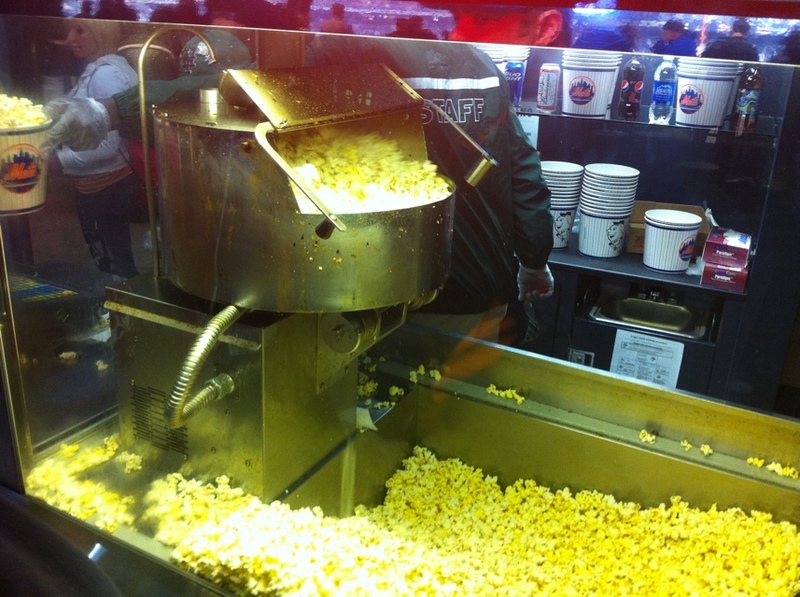 The popcorn at both was fine (admittedly it was impressive at Yankee Stadium) – but it’s popcorn. Popcorn is never what you might call “great.” It can however be really bad. The Carl’s cheesesteak is certainly rich and tasty, but it is a wet, gloppy mess. Blue Smoke, the Taqueria, Shake Shack – all of these certainly give it a serious run for its money. The best thing I’ve had at Yankee Stadium in fact is the Lobell’s sandwich, which is serious. But I think the Shea food is better. I will acknowledge the peanuts point. They are better at Yankee Stadium. For price, beer, selection: it’s all Mets. I have to second the correction by Jesse. A singular awesome sandwich (and I will say the Lobel’s steak sandwich, at $15, pains me with both its deliciousness and its price point), and awesome frickles (fried pickles) from the Brother Jimmy’s stand ($8 for 8 pickle chips, perfectly fried and seasoned)… do not by any means beat out the amazing offerings from Citi. I don’t love every single thing from Citi Field, but far and away there are more foods to try and delight in. This season, Blue Smoke upped the game by offering fried chicken by the piece on promenade level (this is NOT available at the location in Taste of the City), and returning my beloved chipotle wings to the menu as well. Is it good? Yes. The best? No… but can you get fried chicken – very good fried chicken, at that – at Yankees Stadium? Can you get Mama’s? Can you get… Really, the most convincing argument I’ve ever heard about Yankees Stadium vs. Citi Field regarding the food is: “We’re here to watch baseball, the food is ancillary aside from hot dogs and beer.” And that’s fine, I totally get that. But if we’re comparing food to food, there’s just no comparison. Yankees Stadium was built knowing that people will go there regardless of the food options, and they will pay both to get in and for bad food. Citi Field was built knowing that we needed something extra to get bodies in seats, and good food seemed a good way to go about that. It is well worth your time to make the trip to Leo’s Latticini. The women there are marvelous and after just a few visits they will shove more food at you than you could possibly consume, especially if you show them your love of Italian food. Their fresh mozzarella is sublime, their pastas and dishes to go are fantastic, and of course the original, authentic Mama’s special is a winner. Love that place, must go back for some shopping.